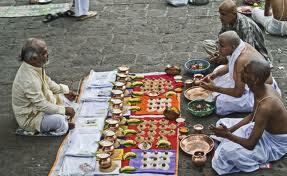 The food and prayers offered during this time is believed to reach directly to theancestors. It is during this fortnight in the entire year that the Atmas of ourancestors transcend to earth with the permission of “Yamaraj” to give blessings to their children and receive their offerings. One of the very important personalities of Mahabharata, Karn ( the son of Kunti-Surya and supposedly brother-like to Pandavas) who is fondly remembered as “Daanveer Karn” made lots of charity in form of jewels, money and lands. When he died and ascended to heaven, he got all that he gave in form of charity in multiples. But, he didn’t get food as he did not give food-charity. He starved for days and finally asked the “Yamaraj” if he could get a chance to make for this deficiency. Yamaraj allowed him and granted a period of 14 days to go back to the earth and make for it. These 14 days were used by Karan to give numerous food-charities and he also offered Shradh to his ancestors. When he finally returned back to the heaven, there was plenty of food available to him. Thus, in Hindus, it is considered very auspicious to donate food in form of Shradh to poor, as whatever donated is supposed to reach directly to one’s ancestors. During these days and especially on the day of new moon it is believed that the soul of the dead ones (Atmas), are permitted by Yamaraj to reach earth and receive the benefits of these rites from their children. According to Lord Krishna “The soul never dies”, it only transforms from one external form (body) to another. Thus it is believed that in whatever form our ancestors exist, the charity during this time surely reaches them. 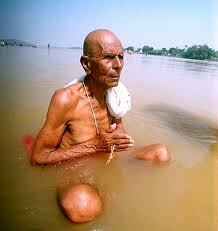 The sons performing the rites of Pitru Paksha are free of any Pitr dosh and are eligible for Pitr lok. It lasts for a fortnight and the day to perform the rituals depend on the Tithi, calculated according to the Hindu calendar. According to ancient Vedic Scriptures everyone is indebted to one’s ancestors. 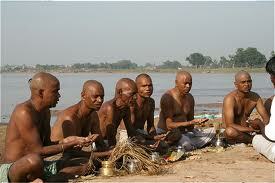 Shradh performed during the month of Pitr Paksha is a way to pay homage to one’s ancestors and receive their blessings. Although funeral rites are considered inauspicious, Shradh is very auspicious and sacred especially in Hindu religion. It is believed that during Pitr Paksha the departed ancestors leave their abode of Yama and come down on earth to take rites from their descendants. 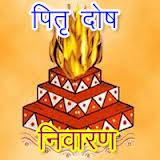 In Hindu tradition the 13th day after the cremation is termed as “Sapindi”, or “Tervi”. It is after these 13 days of ceremonies that Pitr Puja becomes must for every son. It's believed if there is a Pitr Dosh in somebody’s horoscope it is normally observed that the family faces some financial, health related problems. There seems to be a negative energy all around that stops the growth and development of the person or family. Certain wishes, that are not fulfilled and remained attached with the soul of the ancestors. If someone fails to remember and honor the ancestors properly. Bad deeds (bad karma) of children, committed knowingly or unknowingly, that are embarrassing the soul of ancestors. A sudden and unnatural death of any relative ancestors in early age. Bad deeds (bad karma) of our ancestors in earlier life, committed knowingly or unknowingly, that are embarrassing their souls. Lack of fulfillment of parental desires of our ancestors. The exact nature of Pitr Dosh can only be identified after some astrological calculations using one’s horoscope. Although for a common man, these calculations are hard to understand, and thus, there are some common problems associated with Pitr Dosh. Repeated illness of children. Problem in conceiving a child. Quarrels in the family creating mental stress without a reason. Hindrance in educational, professional growth. Make balls of rice and ghee and feed them to cows and fish every Sunday. Charity and services to poor, beggars, old age people, one’s parents. Worshiping Lord Vishnu is a well known remedy of Pitr Dosh Nivaran. If possible, performing Kanya Daan (to perform the marriage of a girl) of a Brahmin Kanya. Perform Rudrabhishek (Rudra Abhishek) in the name of the Kul or ancestors. There are some Pujas that are especially prescribed for Pitr Dosh Nivaran. These Pujas are performed at particular places in India only.